Pomegranates (Punica granatum) have been popular fruit throughout human history and are experiencing a surge in popularity at present due to the health benefits associated with their juice. Widely grown for their edible fruits, they are equally valuable as ornamental plants. While their precise origin is unknown, pomegranates are considered native from the near-Middle East to the Himalayas. The first plants were probably introduced into the southeastern United States by early Spanish settlers to their colony at St. Augustine, FL. Pomegranates have a long history of use in South Carolina. Plants are often found around old home sites and plantations, especially in the Midlands and Coastal Plain. They grow and flower well in most of SC, but tend to fruit poorly in our humid climate as compared to the warm, arid regions where they are particularly well adapted. This deciduous (rarely evergreen) shrub or small tree typically grows from 12 to 20 feet tall and nearly the same in spread. Pomegranates sucker profusely from the base, and if not removed routinely, the plants quickly become dense with many stems. Stems tend to be slender and thorny with reddish-brown bark that becomes gray with age. Leaves may be alternate, opposite, or whorled on the stem and are 1 to 3 inches long by ⅓ to ¾ inches wide. The leaves are glossy, dark green, and somewhat leathery; they turn yellow in the fall and may linger on the plant until early-winter. Pomegranate plants grow at a moderate pace. They will flower sporadically the first year after planting into the landscape and may bear one to two fruits. More commonly they will begin to bear well three years after planting. Although considered long-lived plants (some in Europe are over 200 years old), their vigor will decline after about 15 years. Aside from their fruiting characteristics, pomegranates are enjoyed for their highly attractive flowers that occur over a long period from late-May until fall. Flowers are borne at the ends of branches with one to five flowers in a cluster. The flowers are 1 to 2 inches wide, with five to seven crepe paper-like petals emerging from a thick, fleshy calyx that is vase or urn-shaped. Flower color varies from scarlet-red to orange, yellow, white or variegated depending on the cultivar. Plants may be single- or double-flowering with double flowers resembling carnation blossoms. In general, double-flowering cultivars produce few, if any, fruit. Pomegranate flowers are attractive to hummingbirds. 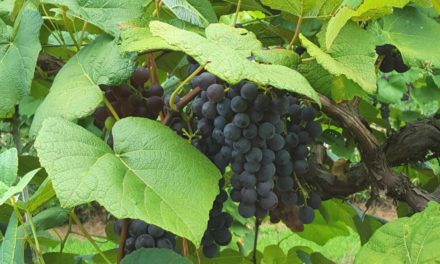 Plants may be striking in the fall during years that climatic conditions allow good fruit set. The globe-shaped fruit are generally 2 to 3 (but may be up to 5) inches in diameter, maturing from green to several different shades of red, depending on the cultivar, and resemble Christmas ornaments. Fruit typically ripen in early fall (August-October). Pomegranate plants are well suited for the shrub border and make a great backdrop for small shrubs and perennials. These shrubs are effective in groups and make good screens. The compact forms perform quite well in large containers. Pomegranate plants are easy to grow and require little maintenance once established. They perform best when planted in full sun, but will flower and fruit sporadically in partial shade. They are adaptable to most SC soils, prefer a soil pH of 5.5 to 7.0 and require good soil drainage. Pomegranate plants are tolerant of moderately brackish water making them good candidates for coastal landscapes. Like most shrubs, they benefit from a 2- to 3-inch layer of organic mulch. Once established they are fairly drought tolerant and require minimal fertilization if fruit production is not desired. If fruit production is desired, irrigating to provide even soil moisture will reduce fruit drop and prevent fruit splitting. Additionally, fertilizing plants in March and July with 1 pound of 10-10-10 for every three feet of plant height will aid in fruiting. Most pomegranate cultivars are cold-hardy in USDA Zones 8 to 10, and should survive with little trouble south and east of the Sandhills. In the Piedmont and Upstate (USDA Zone 7b), they will typically survive the winter, but may be damaged or killed to the ground by temperatures below 10 F. They will usually re-sprout vigorously from the crown after such events. Planting in a protected location may prevent cold injury. Recently, the “Russian series” of cultivars have shown greater cold hardiness (up to USDA Zone 6), good production, and excellent flavor. These should be given consideration in SC. Pomegranates flower on new growth; therefore pruning should be done before new growth begins in the spring. Pruning needs are minimal besides periodically removing suckers and dead wood. 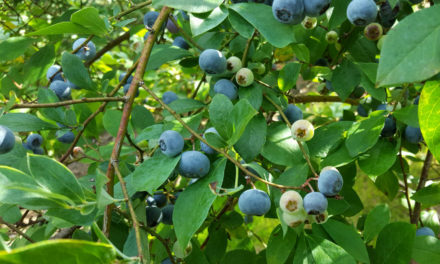 Fruit are produced on short spurs found on 2- to 3-year-old stems. Light annual pruning will encourage new fruiting spurs to develop, but avoid heavy pruning which will reduce fruiting. Pomegranate fruits are berries filled with hundreds of seeds ranging in color from white to dark red depending on cultivar. The fleshy, juicy coating surrounding each seed, often referred to as the aril, is the edible portion. Most cultivars have hard seeds within the aril, but a few are soft-seeded and considered choice edibles because there is no crunching or spitting of seeds. Unfortunately, soft-seeded varieties tend to be less cold-hardy. Pomegranates may be propagated from seed but will not come true to variety. Both hardwood and softwood cuttings root easily, but softwood cuttings require mist to prevent desiccation. To root hardwood cuttings, take pencil diameter cuttings 8 to 10 inches long in winter from previous season’s growth. Treat with a rooting hormone containing IBA and insert half their length into well-drained soilless mix. Rooted cuttings may be transplanted the following year. Pomegranate plants are relatively trouble free when the proper conditions are provided. Leaf and fruit spots are common in SC due to our high humidity, but don’t require treatment. Deer occasionally browse the foliage. The most common problem with pomegranates is their failure to set fruit. Inadequate sunlight and lack of pollination are two of the most common reasons that pomegranates do not set fruit. Plant two or more pomegranate plants, as cross-pollination increases fruit set. There are numerous pomegranate cultivars, but SC gardeners, particularly those in the Upstate, should seek out the most cold-tolerant ones. The list below contains some of the most commonly available that perform well in SC. ‘Ambrosia’ produces very large, sweet fruit. Requires protection above Zone 8. Angel Red® is a soft-seeded type with lots of juice. Requires protection above Zone 8. ‘Wonderful’ is the most common cultivar and the standard by which others are judged. It has red flowers followed by extra large red fruit that ripen in September. Eight to 12 feet tall at maturity. ‘Pleniflora’ has red, double flowers. No fruit. ‘Early Wonderful’ similar to ‘Wonderful’ but ripens about two weeks earlier. ‘Eversweet’ is a soft-seeded type with light red arils and clear juice. ‘Granada’ has darker red, less tart fruit than ‘Wonderful’ and ripens one month earlier. ‘Eight Ball’ has nearly black fruit. Grows to about 8 feet tall. ‘Utah Sweet’ is a soft-seeded type with light pink seeds and clear juice. Orange flowers. Hardy to Zone 7 with protection. ‘State Fair’ will grow to about 5 feet tall and produces many dwarf fruits (less than 2 inches in diameter). This selection is very cold hardy and flowers profusely. ‘Nana’ is the most dwarf variety. It grows 2 to 3 feet tall with red-orange, single flowers followed by small fruit. More cold hardy than others of the species. While there are 19 cultivars in this group, often listed by number, the following are becoming more available from nurseries. ‘Afganski’ (R26) produces medium-sized fruit with sweet-tart flavor. Dark red arils. ‘Salavatski’ (R8) is an excellent producer of large fruit whose light red arils yield a fruity, sweet-tart juice. Semi-soft, edible seeds. Excellent juicing variety. ‘Surh-Anor’ (R33) is a semi-dwarf bush type (up to 10 feet) with very sweet juice. Arils are a clear, pale red.